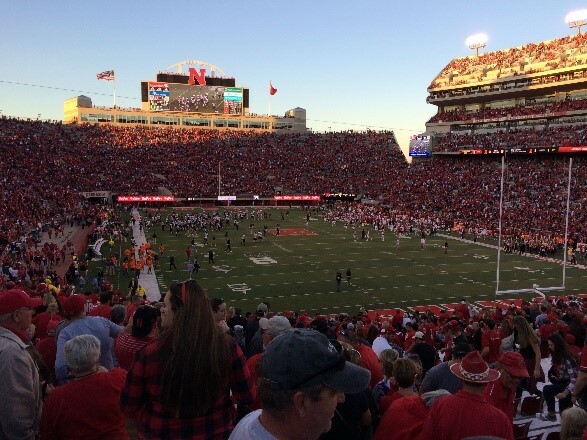 Imagine … this could be your view when Ohio State visits Nebraska on Saturday, September 28! Special Nebraska Game Day Raffle for the Ohio State game … A “Suite” Deal! The package includes two game tickets and a suite for two on both Friday and Saturday nights (September 27 and 28) at the Marriott Residence Inn Lincoln South. There is no limit on the number of tickets you can purchase. 1 raffle ticket for $5 3 raffle tickets for $10 8 raffle tickets for $20 50 raffle tickets for $100 Raffle chances will also be available for purchase at the first two Watch Parties. The winner will be notified by September 14, 2019. This package is valued at over $700. Help support the Oklahoma Cornhusker Club Scholarship Fund, and enjoy a great Husker football weekend! Copyright © 1981-2019 Oklahoma Cornhusker Club. All rights reserved.